Height Adjustable Flipper Tables easily accommodate a range of ages and sizes with the Height Adjustable Flipper Table, the most flexible table on the market. Now available in two height ranges for even more flexibility! 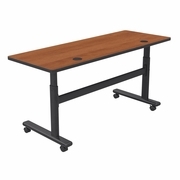 The standard Height Adjustable Flipper Tables adjust from 24 1⁄4" to 32 3⁄4" high. Come Oct. Taller models are available that adjust from 28 1⁄2" to 45" high, call for pricing. Tops flip back with a simple one handed lever mechanism to allow for easy nesting and storage. Each features a 1" thick HPL top available in six Quick Ship colors (please specify when ordering), or can be customized with any Wilsonart® HPL and edge band. The black powder-coated steel frame includes a stabilizing stretcher bar and 2" locking casters. Tested to support up to 300 lbs.